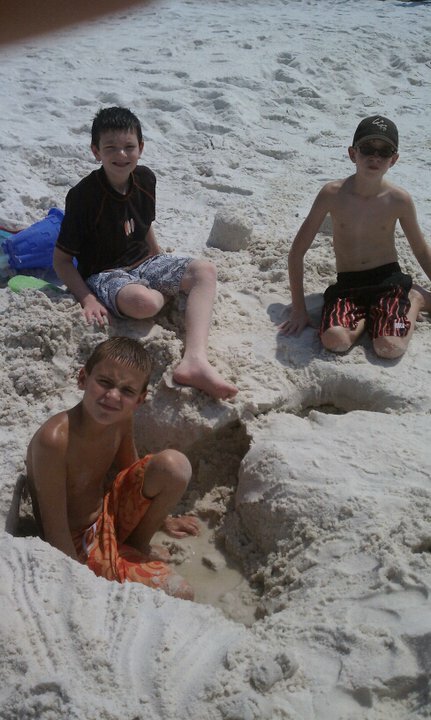 Here is a picture of the boys playing in the sand. Josh is the one with the swim shirt. He does not really tan at all. Karl doesn't either. Anyway, they went to the beach yesterday and had a great time and I heard Grandpa got into their blow up boat and rode the waves. How fun. They posted some pictures of Josh on the beach last night and the boys in the pool. I thought this picture was so funny though, so I decided to post it instead. It is of Josh and his cousin and it looks like they are having a glass of wine. It is juice of course. My sister-in-law says the boys insist on drinking from these glasses everytime. They are so silly. Josh is in the yellow shirt. You can also click the photo to make it bigger so you can see it. Well I met my teacher yesterday where I will be student teaching and she showed me around the building. She was really nice. I will at least now know where the classroom is and where to park. I also know kind of what hours I will need to be there. I hated to ask that, but I have a son I need to know about when I will be home. Karl has been working in Joplin and has been working 10 hour days. He was not getting home until 7PM. He said they are working 8 hour days now, so we shall see. I got Josh's paperwork filled out for school, so I plan to take it to the school today and get him enrolled. I think that is all I have plannned today, so no big deal. Tomorrow we look at houses. I hope we find one. I am afraid interest rates are going to go up and I want a good one. Have a great day!! Josh looks like he is having a blast! Student teaching was scary at first, but was ultimately fun. What grade will you student teach? Hope you find your house soon. I read that the interest rates should stay low, so I hope so. Hope you have a wonderful week Lori. Hugs! I bet you really are happy about student teaching. Any special grade? I hope you find your perfect home soon before the rates really go up. Catching up on visiting and surprised to see that Josh is in my state. Is he at Disney? Love to see the beach pictures. That's one of the best parts of FL. Hope he has tons of fun. Hugz! !